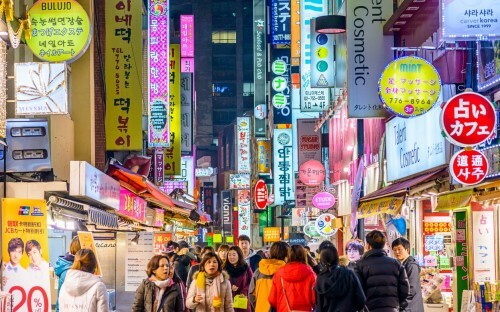 Home > News > Asia > Is South Korea A New Hotspot For International MBA Students? Is South Korea A New Hotspot For International MBA Students? Gangnam Style references aside, it would be an understatement to say that a lot of Western eyes are on Asia these days, geopolitically-speaking. Between supreme leader Trump’s current 10-day expedition through the continent and his recent (terrifying) Twitter spats with Kim Jong Un, American attention spans are focused squarely on the Korean peninsula right now. The truth is that while East-West political relations are always in flux—to put it diplomatically—there’s one domain where the Asian-American connection is more robust than ever, and that’s education. South Korea, in particular, boasts among the most globalized educational opportunities on the continent. Seoul has long been known as both a study abroad destination for Westerners but also a hub for ESOL teachers and global trade. No institution embodies South Korea’s international scope more than Sungkyunkwan University’s SKK Graduate School of Business. 2017 has seen a perfect storm of sorts for SKK GSB. Earlier this year, Financial Times ranked SKK GSB #54 in the world on its Global MBA rankings (#51 in 2013), as well as #1 in Korea and #11 in Asia. FT ranked the school highly in terms of globalization, program diversity, and career development. 30% of full-time MBA students at SKK GSB are international. Founded in 2004 to meet a nationwide scarcity of marketers, financiers, and managers, SKK GSB’s growing international reputation is due in no small part to its English-language curriculum, where Western study takes shape in an Eastern environment. The school’s international partners include Indiana Kelley, MIT Sloan, Dartmouth Tuck, HKUST Business School, and IE Business School, among others. SKK GSB’s high-quality yet affordable education and deep ties to Korean electronics conglomerate Samsung, the school’s main corporate partner, have also enticed more and more Western students to take the road less traveled when it comes to a business school experience—where East and West merge seamlessly. Indiana native Derek Laan, SKK GSB ’14 is a prime example. Derek graduated from Purdue in 2009 and opted to move to a small town outside Seoul to teach English at a public elementary school for three years. He realized was interested in moving into business but felt attached to his adopted home and had no interest in returning to the States. Derek was also thrilled about the rigor of the MBA curriculum. “I can personally attest that SKK is very similar to the classroom experience you would get in a top US MBA program,” he says. Outside the classroom, Derek’s Korean language skills and strategic location led him to an internship at Doosan Heavy Industries & Construction, a large Korean conglomerate in an industry he aspired to enter after graduation. After a year at Kelley in Bloomington, Indiana, he returned to Korea and assumed a position at Doosan. While Derek’s story is certainly unique and inspiring, both culture shock and language barrier pose daunting challenges for Westerners accustomed to less dynamic environments. I’m sold on SKK GSB but what about Seoul’s precarious neighbors to the north? One persistent fear that seems especially relevant right now is the mere 121 miles that separate Seoul from the DMZ.